98% of the polyunsaturated fatty acids are the omega-6 linoleic acid (C18:2 n-6 c,c) with the 2% remainder being the omega-3 alpha-linolenic acid (C18:3 n-3 c,c,c). Some medical research suggests that excessive levels of omega-6 fatty acids, relative to omega-3 fatty acids, may increase the probability of a number of diseases and depression. Modern Western diets typically have ratios of omega-6 to omega-3 in excess of 10 to 1, some as high as 30 to 1, partly due to corn oil which has an omega-6 to omega-3 ratio of 49:1. The optimal ratio is thought to be 4 to 1 or lower. A high intake of omega-6 fatty acids may increase the likelihood that postmenopausal women will develop breast cancer. Similar effects were observed on prostate cancer. Other analysis suggested an inverse association between total polyunsaturated fatty acids and breast cancer risk. 1 2 3 4 5 6 "Nutrient database, Release 24". United States Department of Agriculture. All values in this column are from the USDA Nutrient database unless otherwise cited. 1 2 3 4 5 Katragadda, H. R.; Fullana, A. S.; Sidhu, S.; Carbonell-Barrachina, Á. A. (2010). "Emissions of volatile aldehydes from heated cooking oils". Food Chemistry. 120: 59. doi:10.1016/j.foodchem.2009.09.070. ↑ Lands, William E.M. (December 2005). "Dietary fat and health: the evidence and the politics of prevention: careful use of dietary fats can improve life and prevent disease". Annals of the New York Academy of Sciences. Blackwell. 1055: 179–192. doi:10.1196/annals.1323.028. PMID 16387724. ↑ Hibbeln, Joseph R.; N; B; R; L; Nieminen, Levi R.G. ; Blasbalg, Tanya L.; Riggs, Jessica A.; and Lands, William E.M. (June 1, 2006). "Healthy intakes of n−3 and n−6 fatty acids: estimations considering worldwide diversity". American Journal of Clinical Nutrition. American Society for Nutrition. 83 (6, supplement): 1483S–1493S. PMID 16841858. ↑ Okuyama, Hirohmi; Ichikawa, Yuko; Sun, Yueji; Hamazaki, Tomohito; Lands, William E.M. (2007). "ω3 fatty acids effectively prevent coronary heart disease and other late-onset diseases: the excessive linoleic acid syndrome". World Review of Nutritional Dietetics. World Review of Nutrition and Dietetics. Karger. 96 (Prevention of Coronary Heart Disease): 83–103. doi:10.1159/000097809. ISBN 3-8055-8179-3. PMID 17167282. ↑ Daley, C.A. ; Abbott, A.; Doyle, P.; Nader, G.; Larson, S. (2004). "A literature review of the value-added nutrients found in grass-fed beef products". California State University, Chico (College of Agriculture). Retrieved 2008-03-23. ↑ Simopoulos, Artemis P. (October 2002). "The importance of the ratio of omega-6/omega-3 essential fatty acids". Biomedicine & Pharmacotherapy. 56 (8): 365–379. doi:10.1016/S0753-3322(02)00253-6. PMID 12442909. ↑ Emily Sonestedt; Ulrika Ericson; Bo Gullberg; Kerstin Skog; Håkan Olsson; Elisabet Wirfält (2008). "Do both heterocyclic amines and omega-6 polyunsaturated fatty acids contribute to the incidence of breast cancer in postmenopausal women of the Malmö diet and cancer cohort?". International Journal of Cancer. UICC International Union Against Cancer. 123 (7): 1637–1643. doi:10.1002/ijc.23394. PMID 18636564. Retrieved 2008-11-30. ↑ Yong Q. Chen; at al (2007). "Modulation of prostate cancer genetic risk by omega-3 and omega-6 fatty acids". The Journal of Clinical Investigation. 117 (7): 1866–1875. doi:10.1172/JCI31494. PMC 1890998 . PMID 17607361. ↑ Valeria Pala; Vittorio Krogh; Paola Muti; Véronique Chajès; Elio Riboli; Andrea Micheli; Mitra Saadatian; Sabina Sieri; Franco Berrino (18 July 2001). "Erythrocyte Membrane Fatty Acids and Subsequent Breast Cancer: a Prospective Italian Study". JNCL. 93 (14): 1088–95. doi:10.1093/jnci/93.14.1088. PMID 11459870. Retrieved 2008-11-30. Dupont J; PJ White; MP Carpenter; EJ Schaefer; SN Meydani; CE Elson; M Woods; SL Gorbach (October 1990). 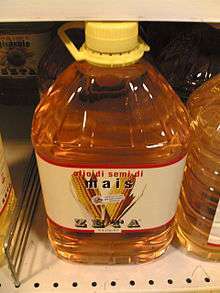 "Food uses and health effects of corn oil". J Am Coll Nutr. 9 (5): 438–470. PMID 2258533.